I had no idea that there was once a Victorian tradition of reading a ghost story on Christmas. Without doing any research at all into the matter, I suspect that this tradition may be at least one of the sources of Dickens' A Christmas Carol. But other than that famous story of a haunting, I had never before come across a tale that might have been a part of that tradition until I was sent this short tale. Of course, that could also be because ghost stories generally fall outside the realm of my usual reading choices. Miss Pym bought an almost complete set of Crown Derby china several years at a local estate sale and she's always wanted to have the full set. After all, she's only missing one plate. Back in the neighborhood for the holidays, she determines to see if the missing plate has been found. But when she heads off to the purportedly haunted neighbor's house in the drear of winter in hopes of completing her set, she has no idea of what she'll encounter. Her journey is strangely disconcerting and the neighbor, who she hasn't met before, is decidedly queer. Her unease grows and when she finally leaves the cold and oddly smelling estate, she makes an unsettling discovery about her visit and what she encountered there. This vintage story is a very brief one and not surprising at all; the conclusion being obvious long before the reader gets to the final pages. 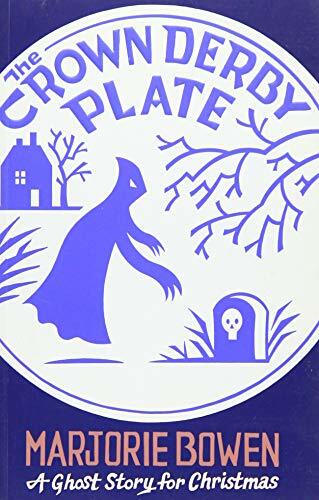 The feel of the writing is very much reflects the Victorian interest in all things ghost and death despite the story not being particularly chilling. I was very definitely not the reader for this tale, feeling nothing so much as baffled by the draw of the story when I finished it. Put in context of the time it was written in, I can appreciate it for its place in historic literary trends if not nearly as much for its plot. Thanks to the publisher for sending me a copy of the book to review.